Building owned by the Ministry of Education, Culture and Sports, awarded in an administrative concession for use to the FCQ. 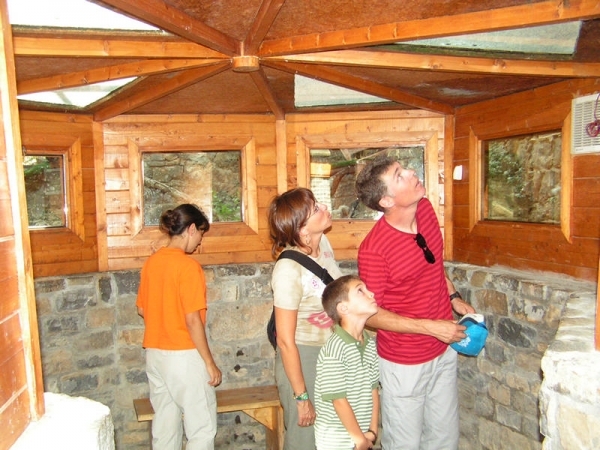 Managed and maintained by the FCQ, you have 12 exhibition areas on Pyrenean biodiversity and a zoo. Within the center there is an office for the development of administration and coordination tasks. Also and in the same locality there is a place to store material (marking and capture of bearded vultures, “hacking”, freezer cabinets, etc.). Information on natural values ​​and protected areas. Service of guided visits to the natural environment. 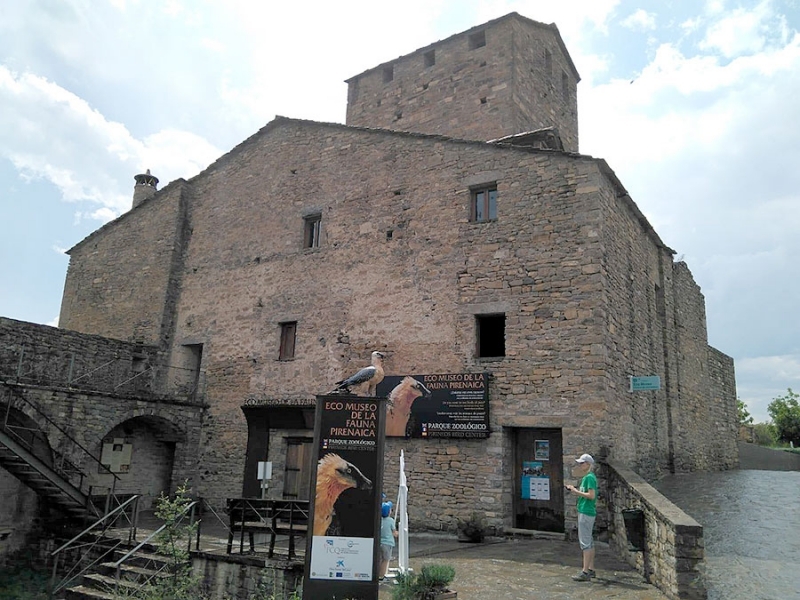 A nature shop (publications, crafts, souvenirs related to the fauna of the Pyrenees, local products). 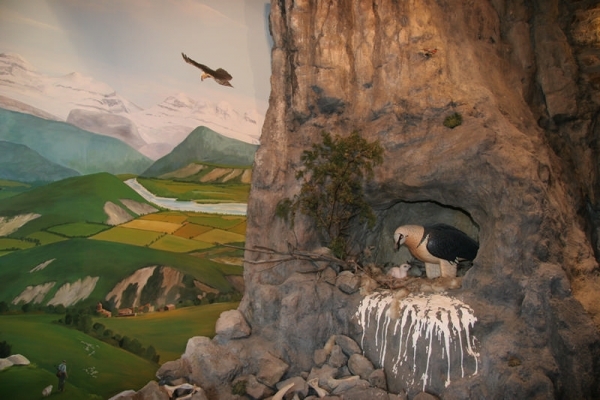 The permanent exhibition of the The Eco Museum – Visitor Centre/ Pyrenees Bird invites you to visit the impressive Pyrenean mountain range, where the forests and meadows, rivers and waterfalls, rocky outcrops and gorges, peaks and glaciers and their flora and fauna are the protagonists. The exhibition starts by describing Aínsa, the Sobrarbe region and the Pyrenees mountain range. Following this it shows us, in a very visual way, the natural and cultural wealth of the Pyrenees, its diverse ecosystems, its people and customs, and how to conserve them. After this introduction, the exhibition will transport us to the mountain, invite us to enter the forests, rocky peaks and peaks of the Pyrenees and discover the multitude of life in each environment. In addition, we will discover the secrets of the great, winged treasure of this mountain range, the Lammergeier. 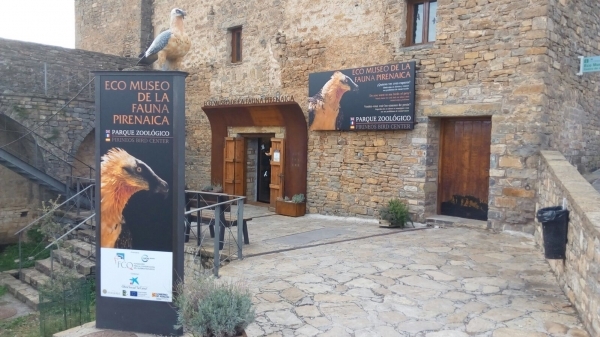 An audiovisual projection “The Mountains of the Lammergeier, Pyrenean biodiversity, a living treasure”. 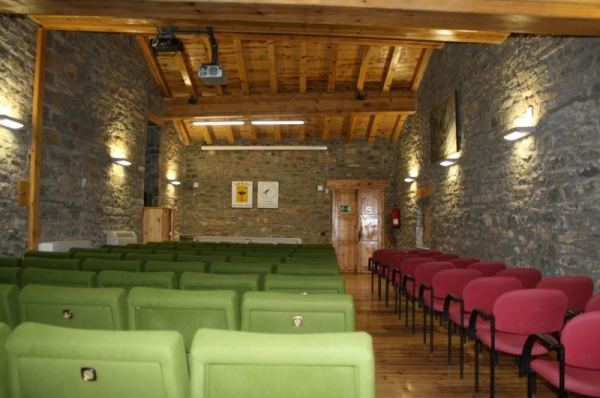 The screening takes place in a multipurpose room that is able to hold conferences, colloquiums and congresses, with a capacity of 80 people. 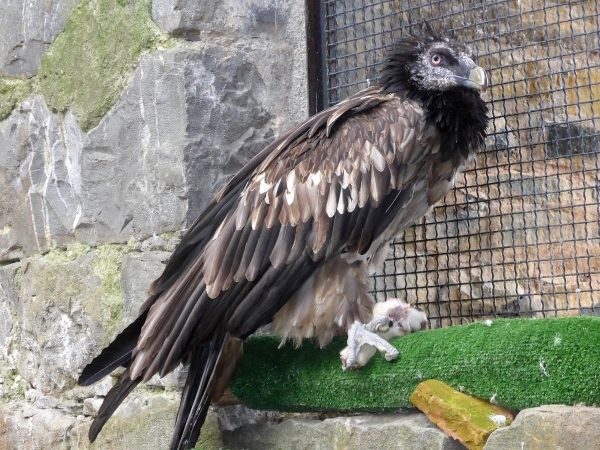 The Eco Museum offers us an exhibition about raptors incapacitated to live in freedom, addressing their fascinating biology, their problems, and the efforts being made in realation to their conservation. Guided by a public educator. The visit is made through an observation tunnel with mirrored windows that allow the unrecoverable birds to be observed without disturbing them. Destined for the public use of the inhabitants of the Sobrarbe area. This space offers an environmental documentation service (library, video library, sound library, multimedia and internet) related to Pyrenean environmental issues. Every day from 11.00 a.m. to 7.00 p.m.
Every day from 11.00 to 14.30 and from 15.30 to 20.00. Closed Winter season (from January 6 to 31). * Holiday weekend of autumn and winter: From 11.00 to 20.00 h.
€ 4 entry per person. Large family € 3 per person. 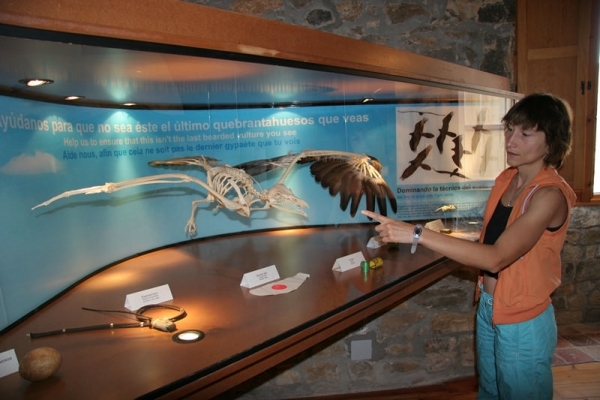 Arranged groups of more than 20 people, € 3 per person, guides free. Route: Sabiñánigo – Torla – Broto – Sarvisé – Prosecutor – Boltaña – Aínsa and return in the day.